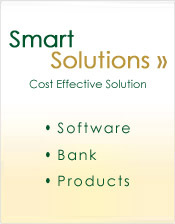 Smart Tax Services L.L.C. envisions Tax professionals and small business owners to flourish with our knowledge and expertise. As a Service Bureau, we specialize in acquiring the right tools for your office environment by training, educating, giving you customer and technical support; not only to enhance your service to your clients but also one that will allow you the opportunities to reach critical new markets through these relationship that will reduce your costs and increase potential revenues. Get ready for the upcoming Tax Season by calling Smart Tax Services. Let’s Do it RIGHT ! !